On Sunday night we arrived back home from our excursion to Texas. The hours in the car were long, but passed by pleasantly with a book or pen in my hand. 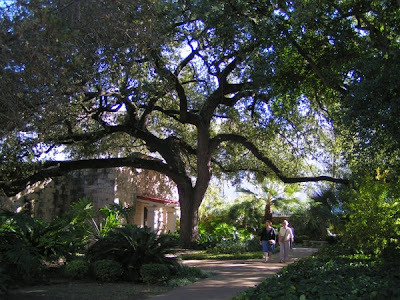 It was wonderful to have a break of routine and relax for a few days in beautiful Texas. We visited relatives after taking Elijah back to college, then arrived in San Antonio on Thursday afternoon. 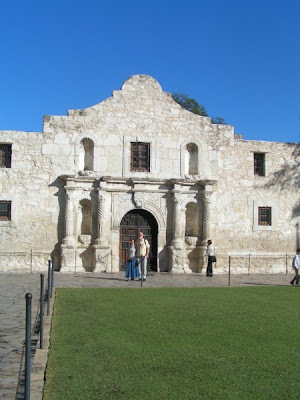 After registering for the film festival, we walked to the Alamo. We'd been 2 years ago, so we didn't read all the displays - but it was a beautiful place to take some pictures! The weather was beautiful. A bit chilly at times, but for the most part pleasant. This tree was amazing! 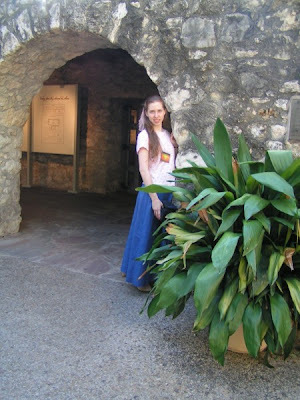 Inside the Alamo, it's so relaxing with God's Creation all around. 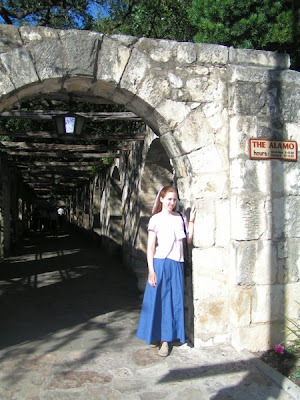 All the stone archways were neat, lending an old-fashioned air. 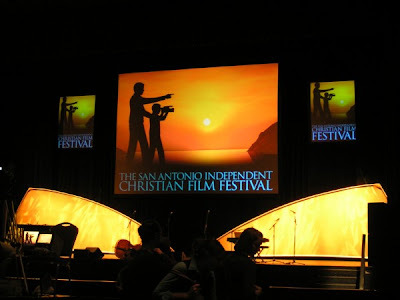 Thursday evening opened the San Antonio Independent Christian Film Festival. We had a wonderful time, watching so many great films! My eyes got reddish and sore after watching movies for two days straight, but it was a delight to see so many good films. I also got to meet Stephanie, which was fun! Our all-time favorite was Heartstrings. It's such a great family film, funny, yet at the same time having a great message. Every family should get a copy (you can buy it by going here). The DVD includes Bubble Trouble, our all-time favorite from the 2005 film festival. Heartstrings definitely deserved the awards of Audience Choice and Best Young Filmmaker! Another highlight was seeing the world family premier of Return of the Daughters. It was beautifully filmed with great interviews and thrilling music. It was very encouraging to hear all of the interviews and see families working together. 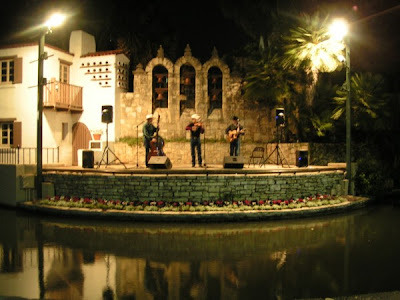 On Thursday and Friday evening, we got to go to the River Theater to hear George Sarris and the Booer Brothers. George Sarris again amazed us with his dramatic storytelling word-for-word from the Bible and the Booer Brothers were a hit with their Coyboy and Gospel songs. Though cold, we thoroughly enjoyed their presentations, staying until 11 p.m. each evening! 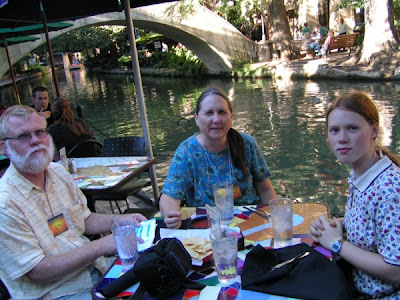 No visit to San Antonio would be complete without going to the River Walk. The water and surroundings were lovely and calming. Again, a great place for pictures! We ate at Mexican restaurants 3 nights in a row, but where else can you get good Mexican food then close to the border? We couldn't stay for the closing ceremonies, having to drive the 14 or so hours home in time for teaching and play practice on Monday. Now it's time for me to get back into routine, after a lovely break spent in the heart of Texas. Oh how wonderful!! I wish I could have gone! That would have been so much fun! I can't wait to see those movies! I'm glad you had such a great time. Thanks for sharing the pics with us. Anna, glad to hear you had a good time. I'm looking forward to seeing some of those excellent films, especially Return of the Daughters. 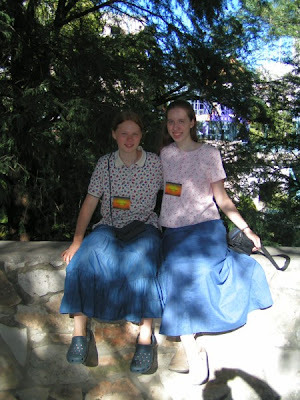 I would love to have gone, and like everyone I bet, I can't wait to see the Return of the Daughters! Beautiful pictures, by the way! I enjoyed the pictures.It sounds like a fun event. I was wondering if you saw a film called Never Be Shaken.I came across the trailer on the blog of the family who made the film and it looks interesting. Robert, Yes I did see "Never Be Shaken". It was a good story and fun to watch! I didn't get to see every movie that was shown, but I tried to get to most of them. I missed you while you were gone! Great pictures! how funny! I was just down in TX myself! 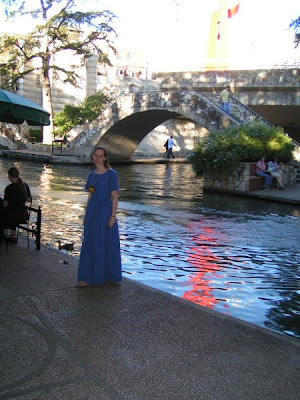 Went to the alamo, river walk and ate at a mexican restaurant! isn't a neat place to vsit!